Welcome to Grand Pines Resort! Luxurious, nostalgically furnished cabins & newly remodeled motel rooms on pristine Round Lake in Hayward, Wisconsin! Take a step back in time & enjoy modern amenities! Leave the hustle and bustle behind and get back in touch with nature. Listen to the call of the loons while telling tall tales around a crackling fire. fully-equipped kitchens & newly renovated motel rooms. a stay at Grand Pines a family tradition that you'll treasure for a lifetime. centers in Northwestern WI! Idyllic resort wedding location! Our fishing guides will make it a fun, comfortable day on the lake for you! We have the boats, electronics, and gear ready to make it a great day on the water for your family! Beautiful year round getaway in Wisconsin's Northwoods. Enjoy some of the finest winter trails in the entire Midwest! for everything from romantic getaways to outdoor escapes. Check in and step out on a sandy beach beneath a canopy of tall pines. 715-462-4006 please call or use our online booking tools to make your reservation request today! Props Landing Waterfront Grille is NOW OPEN! Click below to learn all about it. Sign Up for Specials via TEXT! Receive specials and discounts first when you join our texting program. Text GRANDPINES to 95577. * Standard messaging and data rates may apply. 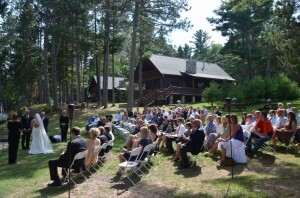 Hayward, Wisconsin’s Finest Cabin Rentals! Charming, comfortable cabin rentals and motel rooms available! Grand Pines Resort & Motel in Hayward, Wisconsin on beautiful Round Lake, offers comfortable, nostalgically accessorized cabins and Northwood’s inspired motel rooms on the shores of one of Hayward’s most pristine, clear water lakes. Grand Pines Resort’s luxurious vacation lodging on crystal clear Round Lake include 20 cabins and 10 motel rooms. 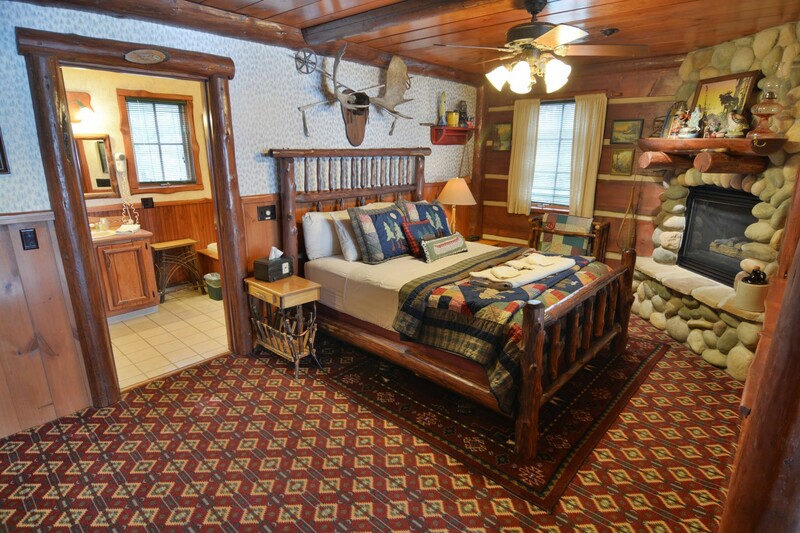 The fully furnished 1-4 bedroom cabins have beautiful, rustic split-log interiors with stone fireplaces. These vacation rentals are some of Hayward, Wisconsin’s finest cabins and are loaded with authentic antiques from the area’s rich history. Cabins are nostalgically accessorized yet they also have modern amenities including high-speed Wi-Fi Internet, cable TV, Jacuzzi tubs, and fully equipped kitchens. Grand Pines Resort’s lakefront cabins combine nostalgia with a touch of class in the heart of Hayward, Wisconsin’s vacationland! Most peak season (summer and fall) cabin rentals at Grand Pines Resort include a pontoon with lodging rentals. (Some private vacation homes in other locations on Round Lake do NOT include pontoon rental). The Hayward Lakes Area of Northern Wisconsin is world famous for fantastic fishing and the experienced fishing guides on the Grand Pines Guide Team are eager to show our resort guests a great time on the water, and ice! Grand Pines Motel also includes 10 renovated motel rooms, located on the sandy shores of Little Round Lake. Rooms include two queen beds, a small refrigerator and sink, a coffee maker, TV, central air and whirlpool jets in the tub. With motel rooms set on a sandy beach beneath a canopy of tall pines, Grand Pines Motel offers a great, year-round lodging in Hayward, Wisconsin. Perfect setting and amenities for gatherings of ANY kind! 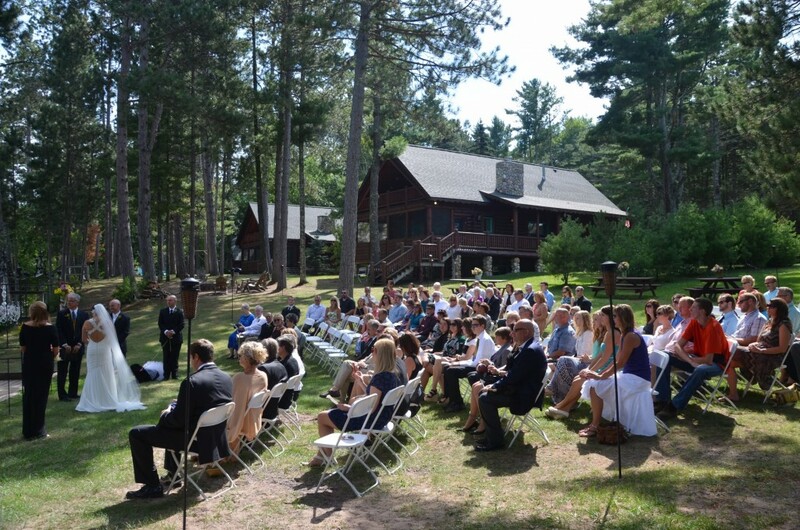 Grand Pines Resort is an ideal destination to hold a group gathering, wedding, corporate retreat, business conference, company seminar, family reunion, fishing weekend or snowmobile trip in Northwestern Wisconsin. Contact Grand Pines Resort to book your next meeting or getaway for your small group! Nestled on over 1,500 ft. of frontage on stunning Big and Little Round Lakes in world-renowned Hayward, WI! Grand Pines Resort’s conference center spaces comprise approximately 3,900 sq. ft. of business and group meeting and event space divided between two separate locations, and can accommodate groups of 10 to 100. Patrons benefit from our year-round lodging collection, 20 Northwood’s-themed cabins and 10 motel rooms, as they provide the ideal match for individual needs and budgets. The Hayward, Wisconsin area offers our guests all kinds of attractions, recreational opportunities, dining experiences and shopping for your whole family to enjoy. Open year round on the shores of crystal clear Round Lake in the heart of the Hayward, Wisconsin vacationland! Book your vacation getaway at Grand Pines Resort & Motel today! All cabins have Wi-Fi and a fire pit. *Some private vacation home rentals managed by Grand Pines that are in other locations on Round Lake do not include pontoon rental.